Read the full TrueSchool 2018-2019 Impact Report here! When educators believe they can make change, they do. TrueSchool pushes teams of educators to believe their collective action can have significant, enduring impact on student outcomes. This belief, called “collective efficacy”, is the single biggest predictor of student achievement. When a team of educators believes in their ability to improve student outcomes, they are more likely to solve problems and find effective solutions. According to meta-analysis by educational researcher John Hattie on the comparative effect sizes of hundreds of high-profile educational interventions, collective efficacy is more predictive of student achievement than homework, socio-economic status, student motivation, and home environment (2016). “Collective efficacy” refers to the belief educators hold about their shared ability to improve student learning. These beliefs shape educator collaboration and the energy dedicated to change efforts and continuous improvement. It’s a virtuous circle: if educators believe their shared work makes a difference, they are more likely to make an even bigger difference. TrueSchool educators engage in a structured process and activities in which they are encouraged to think boldly and explore new ideas. 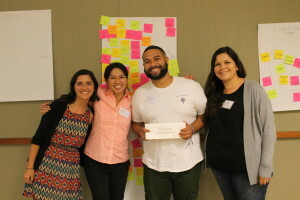 They brainstorm, engage in honest and difficult conversations, and broaden and deepen their own sense of possibility as problem-solvers and change-agents. Rather than commit to one “right answer” early on, educators go through a rapid cycle design process: build, measure, learn, and repeat. They question assumptions, gather stakeholder feedback, and continuously improve throughout the entire process. This focus on ongoing iteration and discovery, creates a sense of safety and encouragement to experiment and try new ideas without fear of failure, ultimately building collective efficacy. 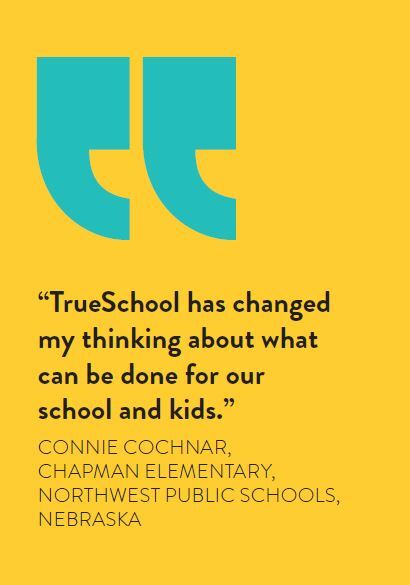 TrueSchool Coaches bring years of experience as classroom educators, school leaders, and community leaders. Coaches provide differentiated support, personalized feedback, and affirmation, helping school teams to broaden and realize their collective potential. TrueSchool exposes educators to models of innovation in other schools and systems that have led to improved student outcomes. These models serve to spark bold, new ideas, and enable teams to build from and adapt what has worked elsewhere, rather than reinventing the wheel. The most powerful driver of collective efficacy is seeing impact: seeing evidence of student progress. When a team measures an improvement in student outcomes as a result of their shared action, their sense of collective efficacy increases. Throughout the year, TrueSchool teams rapidly learn and improve by measuring and reviewing student data. As teams learn what works and refine their innovative learning model, they also, crucially, see the impact being realized for students in real-time. This creates a virtuous cycle: driving forward measurable improvement for students develops the team’s sense of collective efficacy, which in turn empowers them to take on bigger and bolder change efforts, and further improve student outcomes. WHY ELSE DOES COLLECTIVE EFFICACY MATTER? In addition to being the most significant predictor of student achievement, collective efficacy correlates with other drivers of school improvement. Educators with a higher sense of collective efficacy report higher rates of job satisfaction. This means they are more likely to stay and contribute to their schools and districts in the long term. Collective efficacy also correlates with teacher leadership: educators with high collective efficacy are more likely to seek out ways to contribute to the success of the school and the community. Adams, C. M., & Forsyth, P. B. (2006). Proximate sources of collective teacher efficacy. Journal of Educational Administration, 44(6), 625–642. Tschannen-Moran, M., & Barr, M. (2004). Fostering student learning: The relationship of collective teacher efficacy and student achievement. Leadership and Policy in Schools, 3(3), 189–209. Tschannen-Moran, M., Hoy, A. W., & Hoy, W. K. (1998). Teacher efficacy: Its meaning and measure. Review of educational research, 68(2), 202-248.